Special dedication ceremony for the Assateague Island Seashore National Park Stamp as one of 16 National Parks Forever stamps being issued to celebrate the National Park Service on its 100th anniversary. Free. Open to the public. The webcast will originate from the World Stamp Show in New York and include a live remote from Assateague Island National Seashore’s visitors center in Berlin, MD to the New York City event as the world’s largest stamp show that only takes place in the United States once a decade, World Stamp Show-NY 2016. BACKGROUND: The Postal Service is dedicating a pane of 16 Forever stamps to celebrate the National Park Service on its 100th anniversary. Wild horses of Maryland’s and Virginia’s Assateague Island National Seashore is one of the Forever Stamp images on the pane. A photograph by Tim Fitzharris of Fayetteville, AR, was used to create the image. This barrier island is a tale of constant movement and change. Explore sandy beaches, salt marshes, maritime forests and coastal bays. Bands of wild horses freely roam amongst plants and native animals that have adapted to a life of sand, salt and wind. 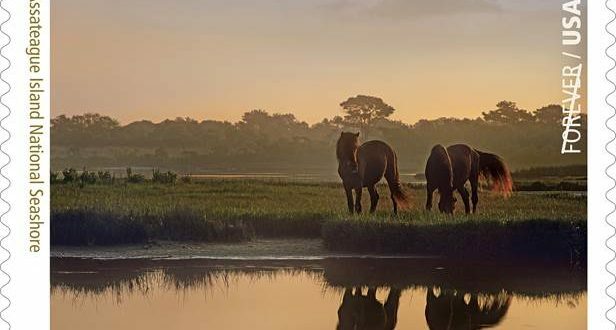 Visit this link for more information about Assateague Island National Seashore. The official first-day-of-issue ceremony is taking place June 2 in New York City at the world’s largest stamp show that only takes place in the United States once a decade, World Stamp Show-NY 2016. More than 250,000 visitors are expected to attend. Similar to Assateague Island National Seashore, more than a dozen special dedication ceremonies will take place on June 2 at or near the National Park locations depicted on the stamps.